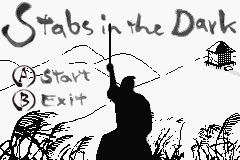 Not to be confused with Stab in the Dark. Info "I am the master. I'll take on all enemies who come my way. Bring it on!" Stabs in the Dark is a souvenir in WarioWare: Twisted! found in the Games section. It is based on the Stab in the Dark microgame, and is essentially an infinite version of it. The game involves a silhouetted samurai (controlled by the player) protecting himself from enemy samurai by either countering their swords or poking them in the stomach with his own sword. The goal is to defeat as many samurai as possible; as an end cannot be reached, the game only ends when the player loses. After fifty samurai are defeated, there is a short pause from enemy attacks and a quote from the player samurai, and after fifty more samurai, every subsequent hundred prompts a quote: "That all?" at fifty, "Weak!" at 100, "What was that?" at 200, and "Still not ready..." at 300 and beyond. This page was last edited on April 3, 2018, at 17:04.